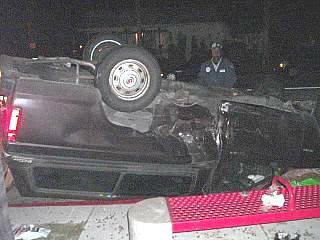 (December 19, 2004, updated Dec. 20) -- A collision in which one vehicle overturned has taken place on Orange Ave. at 36th St., one block south of the site of a November 27 fatal crash. 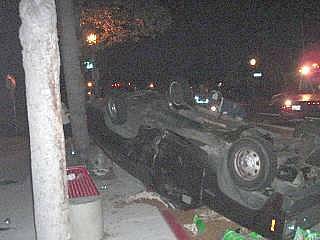 Photo credit: Mike Kowal LBPD and LBFD confirmed reports (brought to our attention by LBReport.com readers, thank you) that the accident occurred at approximately 10:00 p.m. on December 18. 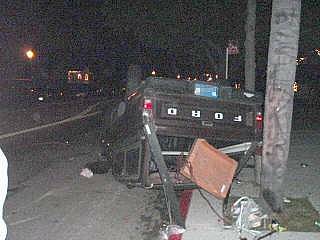 [update] On Dec. 20, LBPD Public Information Israel Ramirez told LBReport.co that LBPD accident investigators say a 1985 Chevy Citation heading westbound on 36th St. collided with the 1986 Ford pickup heading south on Orange Ave.
[update] Incredibly, the driver of the pickup truck was able to self-extricate himself from the rollover accident, LBPD says. When you see news happen, email us at mail@lbreport.com.